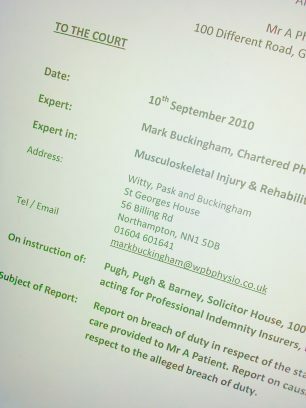 Mark Buckingham is an experienced expert witness and created the Expert Witness panel, Medico Legal Physiotherapy, in 2013. This panel includes Nick Worth, Leian Lee and Jo Bradbrook. We are able to produce preliminary opinion, screening, short form and full Part 35 reports for medico-legal cases. On occasion we appeared in court as expert witnesses and understand the joint report process as well as the needs for meeting with lawyers and barristers. We have worked on general negligence cases as well as elite sport.